Back To School Eye Exams & Zoobug! Don’t have trouble focusing at school! Eye2eye now carries Zoobug for kids – a fantastic line of kids sunglasses and frames from London. The designs are perfect for your little ones and will certainly help start the new school year off right! – Zoobug was founded by Dr. Julie Diem Le, an eye surgeon who saw a need for quality children’s frames and sunglasses. – Proper fitting frames and sunglasses are necessary for healthy vision and proper UV protection. Stop in for a Back to School Eye Exam! Poor vision can be a big cause of trouble in school. Make sure your child starts school with their best foot forward and schedule a back to school eye exam today! 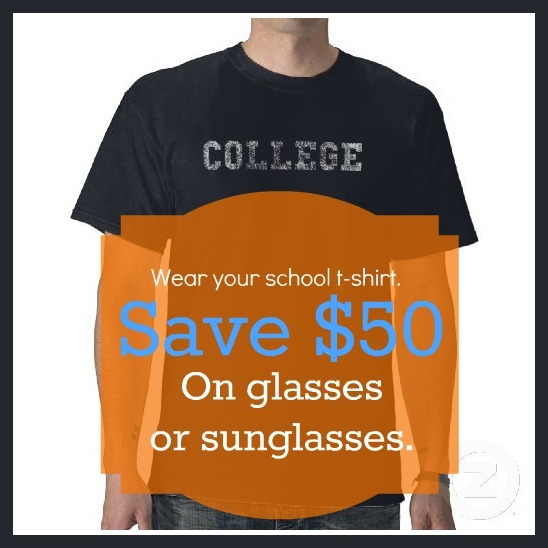 Wear your school t-shirt to our store and save $50 on eyeglasses and sunglasses now through the end of August! Make sure you snap a picture of yourself in that t-shirt too. Upload the picture to our Facebook page and be entered to win a FREE pair of sunglasses. If you win, you will be able to choose from Zoobug (new brand in from London), Michael Kors and Ray Ban! Start snapping those pictures and start the school year off right with a snazzy new pair of shades!